Iris is from the Pokemon bwhite version & Pokemon black 2 & white. 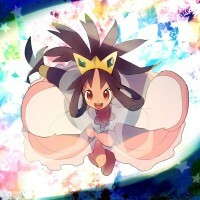 She ether was the gym leader in Opelucid city in white version. She first appeared to aid Bianca, Burgh, and the playable character when Bianca's Munna was stolen, & acted as a bodyguard. In Black 2 & White 2, she was the champion. Iris specializes in dragon types. Iris also appeared in the anime seasons 14-17 as Ash's female companion. She stopped the bike gag, & was the first for ash to ask her on his journey (though she declined). Her goal was to be a dragon master. She came from a village of dragons & got an axew when he was a baby. There she fought a drilbur & caught it herself. Sadly, it became disobedient once she lost to Drayden. Though it was later resolved when traveling with ash & Cilan. At the start of the series, Iris followed ash around and constantly criticized him. Later on, they became good friends who supported each other & cheered each other on. Ash & Iris often had fun together swinging on trees & also ditched Cilan to hangout in a city. When Iris (& Cilan) left at the end of season 17, they were referred as ash's best friends. So far, Iris is the only girl who didn't have a cameo in the next region that ash went to after he left hers.